1. Banking Crisis - or Planned Wealth Transfer? 4. Time to Short Oil? 5. Does the Government Hate Lower Oil? 8. How Low Will Oil Go - and Will the Metals Follow? Banking Crisis - or Planned Wealth Transfer? In keeping with my usual attitude of “nothing is too morbid to put past the guys” – or at least that nothing should be considered to be outside the realm of their motivations, information keeps popping up that points to more dirty underhanded tricks by criminal elements within our current power structure. I reported last month that I had an opportunity to talk briefly to a former US Fed member of the board of governors who has “kept in touch” and who is still highly involved with his former (and current) counterparts. At least enough o have known that there is a trend toward allowing private equity firms to “invest in” (i.e., gain control of) banks and other financial institutions without being regarded as a bank holding company by regulators and regulated as such. Today, there was even an op-ed article in the NYT that decried this possible scenario as too rife with opportunity for further shenanigans outside even whatever dim light banking regulations and public reporting requirements shine on these institutions of higher lending. This two-time former Fed governor also stated that one lone individual single handedly cooked up the entire enronization scheme of the US mortgage industry and the resulting proliferation of mortgage-debt backed assets through the international hedge-fund and banking universe. As a result, the possibility of a scheme emerges that is so vast that it defies any description in ordinary terms and in ordinary thinking – except if you approach the subject with the premise that the most underhanded and most egregious of motivations are to only possible, but rather constitute the norm and probably constitute distinct understatements of what is really going on. The sad – but inevitable – part is that capable people who become fully aware of their capabilities and who have met with a certain amount of success in their lives tend to attribute their success to their own personal greatness, rather than good fortune and the good graces of a higher power not of their own making. Private property, securely in the hands of the greatest number of individuals, coupled with a sound currency and the rule of law is absolute anathema to those who feel they were destined to rule. In order to exert maximum control, private property must be taken from individuals and must be vested in the hands of the elites. In many societies around the world, this can and has easily been done y brute force on occasion, but here in the United States, this is rather difficult to achieve and maintain. People here don’t easily give up their property and many are armed to their teeth, so the elites figured there must be a better way. Part of that “better way” o course was the continuous debauchment of the US dollar by the federalized banking cartel we know as the federal reserve. – but that apparently was not good enough. Under the system the Fed established, money became principally the property of the state, or rather the bankers who “printed” it under license form the state, but the property people purchased with that debauched money still remained too much under private, i.e., individual, control (I do not consider corporate property “private” in the original sense [ http://www.etymonline.com/index.php?search=private&searchmode=none -- “c.1380, from L. privatus "set apart, belonging to oneself" (not to the state), used in contrast to publicus, communis; originally pp. stem of privare "to separate, deprive," from privus "one's own, individual," from Old L. pri "before."]). One way to deal with that problem is debt. Although the very money we use is created out of a promise to repay and constitutes nothing but evidence of a debt, legally you are allowed to “buy” things with it and are then considered to “own” them, so even that bastardized form of ownership had to be subverted in order to make the power transfer from the many to the few as complete and as lasting as possible. In the old days, people saved money before they would buy a house or a car. Now, people just borrow. Then comes the crash, and people lose their jobs, so the loaned property is repossessed. But, even that wasn’t enough. Remember that we are talking about communism here. Communism is not defined as a state of affairs where property is owned by the corporate superstructure, but as the state of affairs where all means of production are in the hands of the state, not the people. Under our recent form of capitalism, all major means of production were in the hands of corporations already. Now, they needed to be transferred into the hands of the state – and that’s where the trick was employed. People who still think in terms of “country” and domestic government never caught onto the trick of those who were already miles ahead of the crowd in their thinking. The power elites no longer think in terms of country. They think in global terms. The means of production wre transferred from private to corporate control and then to the control of “a state” – except it wasn’t this state, and that’s what escaped so many for so long. The United States’ means of production were to become the property of another state – China. Every US corporation that transfers its production facilities to China only buys time. It is granted the (state granted) “privilege” to build factories and to employ cheap Chinese workers (also owned by the Chinese state) for a period of ten years. After that, all of the physical installations revert back to the state. Bam! (Almost) instant communism for America. Not only are the means of production increasingly taken out of private hands and transferred to state control, they are transferred to foreign state control -- of an openly communist state! It is pathetic to watch American investors as they fall all over themselves “investing” in China, the new land of opportunity. It is a giant wealth transfer from a nominally capitalist country to an openly communist one. The term “private equity” is a misnomer, as is 'privatization' In truth, they should be called 'corporate equity' and corporatization'. Private equity firms and funds are “private” only in the sense that they are not themselves publicly traded. They are firms and conglomerates of highly connected and highly influential people who often sit on the boards of the largest US and international corporations, and sometimes former high-level government officials of the most powerful countries. The world of private equity is a rarefied world of only the super rich and super-connected. The most notorious and most feared among these is the Carlyle Group, which at one time or another has counted notables like former US prez George Bush the senior, former UK prime minister John Majors, Howard Baker III, members of the Saudi royal family, etc. Once taken private, there are no more public disclosure requirements. What is known about which PE fund acquired what company is only known because of voluntary disclosure by the firms and funds for publicity reasons in order to attract more private investor funds. These are the outfits the Fed now wants to empower to purchase controlling shares of failing, publicly traded banks and financial institutions in order to provide the liquidity these banks need to survive and avoid falling into the hands of FDIC regulators – and to avoid having the FDIC run out of assets to cover insured deposits at these banks. The bottom line is that banks can no longer provide the funds they need to survive to each other, and the Fed is getting strapped as well after all of these unconventional “lending facilities” it has provided to banks in trouble to preserve at least a pretense of liquidity and viability. And that means that outfits like the Carlyle Group can gain control of your bank and 'take it private' without themselves becoming subject to Fed supervision. Naturally, that would also take the acquired banks themselves out of Fed supervision and regulatory power to the extent they are completely bought out by these private equity firms. Now, was all of this a planned move by the Carlyle Group? Historically, this is not unprecedented as John Pierpont Morgan’s bank single handedly “rescued” virtually the entire US banking industry by simply buying up all of the distressed banks that threatened collapse as a result of the “Panic of 1907.” To us, this is outrageous stuff that belongs into the realm of fables and conspiracy theories. To “them”, this is how they do business. I have hinted in the last few articles that I suspect oil may the new policy tool of the runaway elites. As such, it has several advantages over so-called blunt tools like interest rate policy – the effectiveness of which is fast approaching zero at this point. It tends to lower the attractiveness of gold in most knee-jerk investors minds, eliminating that competition to the dollar’s 'supremacy'. All of this is now possible without the usual “printing” of new money, which is the normal way of doing things when it comes to helping the stock markets and the economy, and without raising rates and putting all of that in jeopardy when it comes to preventing a complete dollar collapse. Yet, this tool is only effective because the price of oil was first driven to the current, abominable heights. It is therefore simply a short term, stopgap tool of quasi-monetary policy. That is its big limitation. When I read Ted Butler’s recent article on SemGroup’s unbelievable $3.2 billion (most press accounts state $2.4 billion) trading loss (forwarded to me by an astute Monitor subscriber) a couple of really bright red flags went up in my head. It makes sense for an oil storage and pipeline company to use some oil hedging to cushion against possible surprise price shocks to the downside, but it absolutely makes no sense for such a company to short its own product to the tune of billions of dollars. Hedges are usually a fraction of the thing hedged in order to minimize risk. What oil company or oil services company executive would bet against the rising price of oil in such huge amounts if his intention was only to hedge? I’ll answer that for you: Nobody would! Tom Kivisto, Semgroup’s CEO, is a very experienced trading professional. According to Forbes, he headed the oil trading arm of Koch Industries in the early 90’s to start his own trading outfit called “Eaglwing”. In 2000 he secured a loan of $90 million from an Oklahoma bank to “add physical assets to his trading operations” and founded Semgroup. Seven years later, the company was the twelfth largest privately owned US company and had $13.2 billion in revenues. I don’t care how good you are, but that doesn’t happen without help from high places. Looks like Kivisto got exactly that. One of the top investors in Semgroup is the infamous Carlyle Group. The other is Blackstone Group. The world’s number one and number ten private equity firms together own a controlling share of the miracle company. The press explains this whole thing as Kivisto and the other Semgroup Traders just having bet the wrong way when oil hit $100/bbl, thinking that it “must” come down soon, and that “stubbornness” caused them to keep increasing their bets until they could no longer hang on and had to go long oil to cover their accumulated shorts. Ted Butler theorizes that the oil price was artificially gunned when Kivisto and pals were forced to keep buying oil contracts to cover their short bets gone wrong. When the company finally collapsed and was forced to stop covering its shorts and take the losses, the oil price collapsed. Makes sense. What doesn’t make sense is for ultra- experienced professional oil trader Kivisto to have engaged in this silly bet in the first place – unless someone fed him false 'insider information' that the oil price would soon collapse. Who could credibly be the possessor of such alleged inside information? Carlyle Group, with its super-connectivity to the Arab oil sheiks and the House of Bush/Saud. Another thing is that the Carlyle guys know how to cover themselves. Wanna bet that their investment in SemGroup has the highest priority level when it comes to repayment out of the sale of the companies assets currently under way as part of its Chapter 11 reorganization? Here is another point: SemGroup was a big fish in the oil patch. Many smaller oil and oil services companies did business with this fast-growing giant, and many of those are now owed money by SemGroup or simply lost whatever revenue they once derived from doing business with it. I wonder if Carlyle gang will step in and by these small fish at fire sale prices once they go under. The group seems to specialize in buying out distressed businesses and then selling them at huge profit margins after turning them around. What better way to turn a business around than by knowing exactly why it became distressed and then removing the distressing factor after its acquisition? The bottom line is that there is this dual transfer of US productive capacity going on. Regular capacity is transferred to state control - the Chinese state – while oil productive capacity is transferred to private hands – but only top elitist private hands. The people, the American middle class, lose out in the process, and so does freedom. Now, how can smalltime investors like you and me make money off of this knowledge?The question is, how low will the price of oil go? Does it now make sense to short the oil market? It probably does. When the rest of the market figures this out, the entire trading dynamic will reverse itself. Profit-starved investors will try to get in on the game. Demand destruction will do its part to keep the momentum going. For as long as stock markets remain weak, expect the trend to be continued from the ‘official’ circles as well. The only drawback to shorting oil is Iran, of course. Today, news that Iran will not comply with the international demands for cessation of uranium enrichment didn’t help to support the market enough to drive it into positive territory, so anything short of an actual attack on Iraq will probably have little effect from here on out, unless Ahmadinejad comes out with some really stupid remarks to stay in the limelight where he likes it so much. For those who are experienced in trading, shorting oil with relatively tight trailing stop losses on the upside would probably make sense. I think the environment is ripe for that. Does the Government Hate Lower Oil Prices? Here is another gem on the nanny state and how well it looks out for its charges. The Federal Energy Regulatory Commission, or FERC, has initiated several legal actions against companies and individuals “caught” in manipulative short selling of oil. FERC’s explanation for why it pursues these actions? No such action has been forthcoming by the CFTC against manipulative short sellers of gold and silver. Are we to conclude from this that the government hates the outcome of manipulative short selling only when it has the effect of driving the price of energy products down, but not when it has the effect of driving precious metals prices down? Isn’t the government supposed to be “happy” when oil or gas gets cheaper so that inflation is lessened and consumers feel better? Likewise, isn’t the government supposed to be “happy” when people’s wealth position improves, regardless of what it is they invest in? Last month, Brazil still looked like a good area to invest in although clouds were moving in on the picture. Now, things don’t look so good anymore, except on the government bond market – but that is closed to foreign investors. 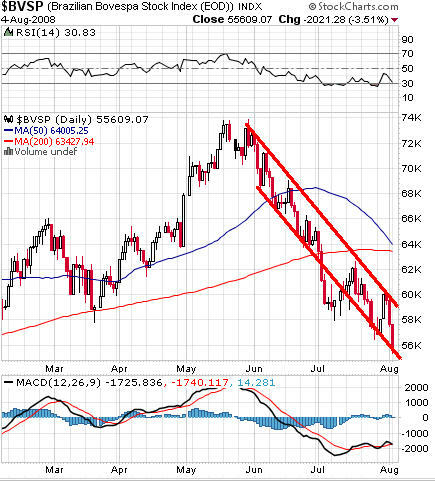 The BOVESPA has spent all of July below its 200-DMA and has been in a tight downtrend channel since the beginning of June that was broken only to the downside once. What’s more, the Brazilian stock market is absolutely dominated by its oil giant, PetroBrazil, and the recent breakdown of oil prices hasn’t helped the index any. In fact, while the turn of oil has helped virtually all other world stock indexes find a temporary ledge on which to rest, the date of July 14th marks the beginning of an even more serious deterioration of the BVSP, as can be seen on this comparison chart. Inflation is running rampant in Brazil at 4.5 percent, and the central bank’s economists expect it to reach 6.5 percent, so the bank raised its policy interest rate by .75 percent to a whopping 13 percent. Too bad government bonds are closed to outsiders. That move will undoubtedly keep the Brazilian real well supported, but it will only help to further suppress the stock market. Since oil prices are likely to continue dropping except if Iran gets attacked, it’s better to stay away from investing there. United States of South America? The left-leaning South American countries of Argentina, Bolivia, Brazil, Ecuador, Paraguay, Venezuela and Uruguay are working at lightning speed to create a Union of South American Nations (USAN) modeled after the European Union. The heads of state of Bolivia and Ecuador, meanwhile, are calling for the institution of a South American currency, and Venezuela’s Chavez piped in that South America should pool their central bank reserves and should stop “financing” the United States. By that he apparently meant the countries should stop supporting the dollar by accepting it in international trade settlement. The USAN movement was only created in 2005. It had its third meeting of the respective heads of state in May this year and seems poised to move forward at the same rapid pace it has employed since its inception. It is unclear whether this should be seen as a positive development or not. On the one hand it appears to be pursued in opposition to US-led efforts at creating a hemispheric trade union under the FTAA. On the other, there is nothing that would prevent the simultaneous efforts of the US with Canada and Mexico to form a North American Union under the SPP or “Security and Prosperity Partnership” from coming to fruition, and once that is accomplished, a merger could easily follow, especially since such a North American Union would occur with two other left-leaning governments. The Bush administration, meanwhile, has done all it can to forever give so-called right-leaning governments and administrations a bad name, which undoubtedly will lead to an Obama victory and a following inevitable left-lurch of the US as a country. (Thais will of course happen even if McCain should win, as he is a ‘conservative’ only by his calling card and only for as long as it suits him – i.e., until he gets elected, if he can. Prospects for Liberty in America are therefore exceedingly dim. It seems as if there will have to be night before it can become day again. Americans have long since forgotten what freedom means. They may need a stark reminder before they will remember. It seems that reminder is now close at hand, and it will likely come both in the form of a war with Iran and a serious economic depression here at home. The only way out of this is for Americans to wake up to the fact that they absolutely have the unquestioned power to change the outcome and prevent any of this from happening. The only problem is that, in order to do this, they need to both inform themselves and then ACT on the information they have by systematically voting to remove all political incumbents from their offices at every election. The only time an incumbent should be allowed to remain in office is if he has proven by his voting pattern that he indeed understands and respects the law he swore to uphold – the Constitution. If Americans don’t take that responsibility upon themselves, they have no one to complain to and nothing to complain about. The fun thing is that it is even easy to do. Very easy. All you have to do is to push the other button on your precinct’s voting machine, not the one next to the incumbent, at each and every election. The rest is just a matter of telling all the people in your periphery to do the same. Whether or not others will follow suit is not really a concern. They certainly won’t if you don’t do it, so all you have to do is start with ‘number one.’ There are a thousand ‘reasons’ why others probably won’t follow suit — but so what? All it takes is a single decision, a single action, and those thousand ‘reasons’ will be of no consequence at all! How Low Will Oil Go – and Will the Metals Follow? The recent downturn in energy prices has taken on its own momentum, and that momentum is accelerating. The question is, how low will it all go? As to the first part of the question, two main factors come into play: (a) Actual demand and supply interaction and (b) consumer/trader/investor sentiment. Oil initially turned lower after the Commerce Department reported that consumer spending fell in June as shoppers dealt with higher prices for gasoline, food and other items. That bolstered analysts' arguments that a U.S. economic slowdown is forcing Americans to scale back on energy use. Well, it’s not the slowdown that forces Americans to scale back, but the higher energy prices, themselves. So, the question becomes: how far do energy prices need to fall before Americans can resume the level of spending they were at before the oil price bump and before May’s government welfare check? The second question is: will whatever spending level that is or was be enough to bring the economy back out of its recession track so as to avoid a depression? The last question is, how big of an ‘overshoot’ will investor sentiment cause in the downward spiral of oil prices? The final question is: how far will gold and silver prices follow oil down before they rebound and resume their upward trend? I will discuss these questions in turn, but I wanted to upload and send out this part of the August Monitor first, because it will take me a day or so to get the job done in any kind of halfways intelligible fashion. Please remember that it would be a bad idea to sell your gold, silver, or gold/silver ETF holdings or mining stock mutual funds, if you currently own any. The coming weeks, and maybe even months, will be a hair-raising experience for precious metals investors, and many weak hands will have their metal shaken out of them - but the bull will continue.